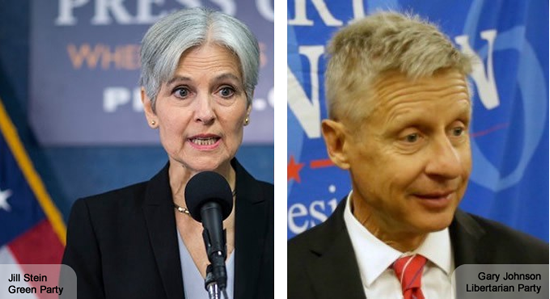 The Democratic and Republican parties aim to exclude Jill Stein (G) and Gary Johnson (L) from the debates. Millions of American voters will remember this 2016 election year as the year they left the two older political parties once and for all. After deeply problematic primaries, including epidemic fraud on the Democratic side, the two parties nominated the least-liked candidates in history. Never in modern politics has a candidate with either Hillary Clinton’s approval rating (-16) or Donald Trump’s approval rating (-18) won a nomination, let alone the White House. These two candidates are widely, historically disliked. 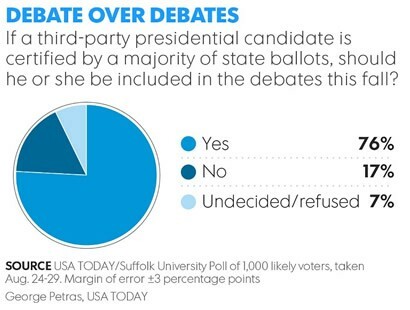 Meanwhile three-quarters of Americans want to see two other candidates in the presidential debates. You can’t find a lot of things that three in four Americans agree on, but polls show a stunning 76% of us want Dr. Jill Stein, nominee of the Green Party, and Gov. 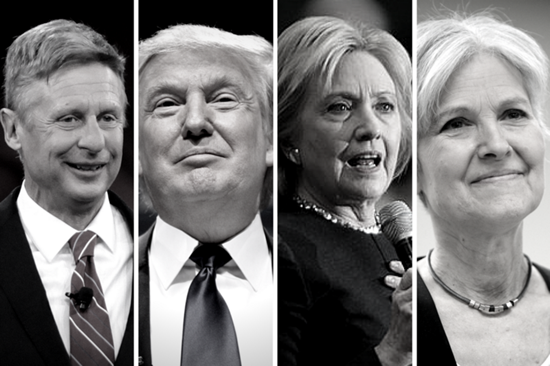 Gary Johnson, nominee of the Libertarian Party, to be included in the debates. Not that this should be surprising. With our democracy fraying, corruption and election fraud on the rise, climate change encroaching on virtually every ecosystem, and income inequality at record levels, it’s a crucial juncture for the United States and for the planet. Citizens of all backgrounds long to hear a broad range of ideas before determining the optimal path forward. 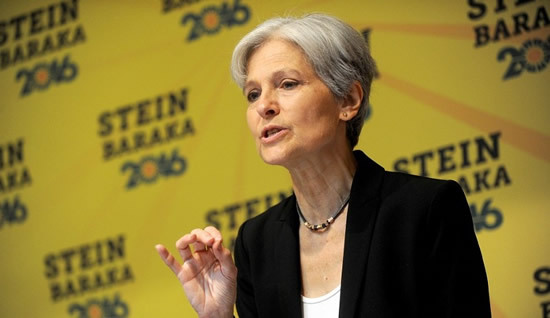 Americans want to see Stein and Johnson in the debates. With climate change a leading issue for many voters, the Green Party, which pushes for immediate action on climate change, should be heard. In light of revelations about domestic spying from whistleblowers like Edward Snowden, American citizens want personal liberty and privacy right now, and for this reason the Libertarian candidate should be heard as well. The two older parties inspire little trust on these 21st century issues. Back at the end of July, as I was leaving home and traveling to the Democratic Convention in Philadelphia, I wasn’t yet certain whether the leaders of the Democratic Party — the Democratic National Committee — were simply incompetent or actually corrupt. As a writer, as a progressive, and as a citizen inspired by the Bernie Sanders campaign, I was interested to see the workings of the DNC up close. I had already witnessed in 2016 the DNC allocate and count “superdelegates” prematurely, which favored the Clinton campaign. I had also seen tremendous irregularities and probable fraud in the primary elections, which also favored the Clinton campaign. In short, I knew the DNC wasn’t running a fair primary between Sanders and Clinton, but I wasn’t sure exactly how unfair it was, and whether it was random incompetence and peccadilloes, or whether it was concerted rigging and intentional corruption to install Hillary Clinton as the nominee. 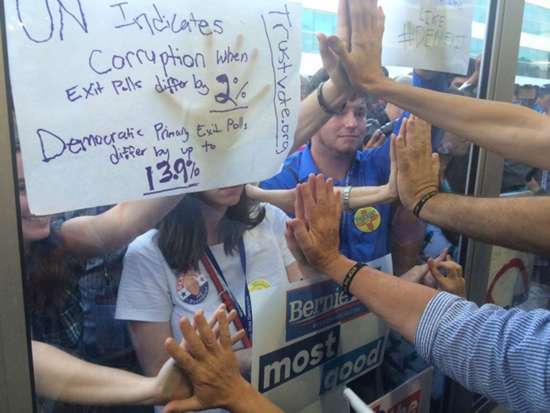 Sanders delegates, volunteers, and supporters have felt marginalized. 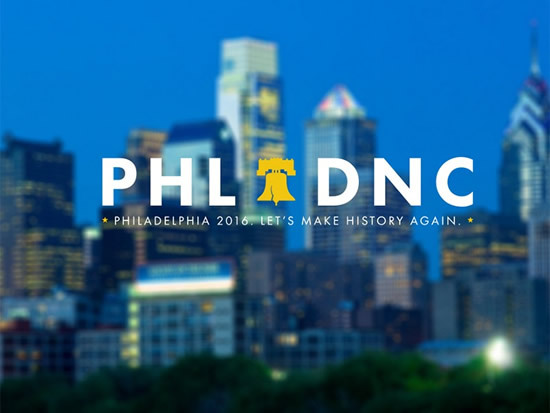 The Democratic National Committee professes publicly that it longs for peace and unity between supporters of Bernie Sanders and Hillary Clinton. The DNC’s actions as organizers of the convention, however, have repeatedly had the opposite effect. To begin, no one who wanted Bernie Sanders as the nominee was ever allowed near the microphone on stage. It is an open convention, regardless of the way it’s been covered in the corporate media; Hillary Clinton did not get the required 2,383 delegates required to win outright from pledged delegates. The superdelegates are casting the deciding votes this week. Bernie Sanders, although issuing an endorsement of Clinton earlier this month, hasn’t conceded the race nor released his delegates and so he could become the nominee. Nevertheless, the entire first day of the convention — ostensibly the “Bernie Day” — featured no speakers who favored a Sanders nomination. Several one-time Sanders supporters who now favor Clinton were allowed to speak. Simply allowing a few Sanders supporters — Nina Turner, for instance, or Tulsi Gabbard, or even Jane Sanders — to speak Monday would have immediately increased feelings of unity. Instead, the convention got off on the wrong foot, fomenting feelings of suppression right away, even before Bernie gave his heart-rending “three minute ovation” speech later that night.